Talking history Another film segment was done in front of the wildlife display at the museum. Photo courtesy Museum of the Mountain Man. 2 camera shoot Red brought a two-camera film crew. Photo courtesy Museum of the Mountain Man. 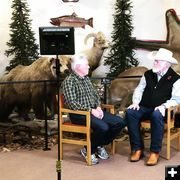 His show focuses on museums and historic sites that present and perpetuate the image and lifestyle of the American West. 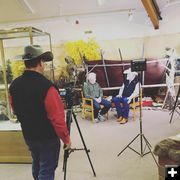 He and his crew have been traveling through Montana and Wyoming visiting museums and historical sites upcoming shows. 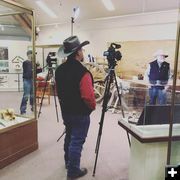 He met with Executive Director Clint Gilchrist to film some talking sessions staged in front of three different museum displays and toured through the Museum taking pictures of displays for filler shots. The episode will run on the RFDTV station sometime in 2019. ‘Somewhere West of Wall Street’ airs Mondays - 9:30 PM ET, 8:30 PM CT, 7:30 PM MT, 6:30 PM PT. Raised in the cow country of the Texas Panhandle with a passion for the western lifestyle, Red Steagall competed in rodeos as a youth and learned to play the guitar and mandolin. After college, Steagall traveled to California to share western traditions and values with the rest of the world through songs, poems, books, television and movies. Although Red Steagall is best known for his Texas swing dance music, he is also highly respected by Texas cowboys for the lyrical way in which he writes about the western way of life. He was honored as the Poet Laureate of Texas in 2006, received the prestigious Charles Goodnight Award in 2006, and was inducted into the Hall of Great Westerners at the National Cowboy Museum in Oklahoma City in 2003. The Museum of the Mountain Man is located in Pinedale, Wyoming. Built in 1990, it interprets the history of the Rocky Mountain Fur Trade Era of the 1820s to 1840s. It also includes displays about early Sublette County and Pinedale history. It works in close association with members of the American Mountain Men Association on displays, artifact interpretation, and living history programs. The Museum is open daily from 9AM to 5PM from May through October, and by appointment during the winter season. The big events of the year for the Museum are Living History Days in May and Green River Rendezvous Days in July. The Museum can be reached at 307-367-4101, by email at director@mmmuseum.com, or on their Facebook page.